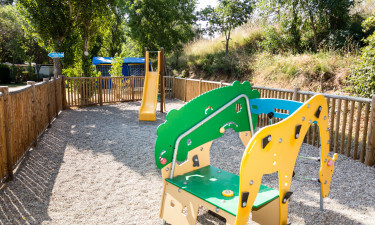 Le Val de Cesse is a family-friendly campsite near Mirepeisset in France. Boasting top quality facilities and a peaceful but enjoyable environment set in the countryside surrounded by nature, adults and children alike will have a memorable and fun-packed holiday when staying at this luxury camping site. Stay in a pristine and comfortable mobile home, fully equipped with top-of-the-range modern conveniences, and make the most of the on-site services for a stress-free vacation. Book now with LUX-camp and take advantage of some fantastic deals. There is no better time to indulge in a family camping holiday that promises to be simply unforgettable. Why camp at Le Val de Cesse? Located directly on the river in the beautiful Aude countryside and surrounded by orchards, Le Val de Cesse comes highly recommended for supreme camping luxury. Only 25km from the sea, which makes fun days out on the beach very accessible, this holiday camping site is also situated very close to a lake where campers can try out some exciting watersports such as sailing and waterskiing. Boat hire is also available, allowing visitors to set sail and have a wonderful family day out. The beach itself offers visitors some excellent surfing opportunities and no holiday is ever complete without a spot of sunbathing on the sand. 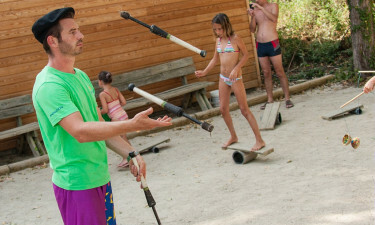 Aimed at families, Le Val de Cesse has so much to offer in the way of activities that campers will find it very hard to get bored. There is a tennis court within the grounds and there are riding and fishing opportunities that visitors can enjoy. The swimming pool is surrounded by sun-loungers where parents can relax but still keep on an eye on the little ones and it also features a waterslide for added enjoyment. With many competitions and tournaments held regularly by the friendly entertainment staff throughout the peak season, there is plenty to get involved in. With so much to do and such wonderful surroundings, Le Val de Cesse is amongst the best sites for luxury camping. For some personal indulgence, a visit to the fitness and spa treatment centre within the grounds is a fabulously calming experience. With an extensive choice of treatments available including full body massages, there is no better way to escape from reality and completely relax. The fitness room allows guests to use the latest machinery to keep fit whilst enjoying their holiday. With a restaurant boasting an extensive menu conveniently located within the grounds of this luxury camping site, campers can enjoy the occasional family meal away from their accommodations. The on-site bar that serves snacks, soft drinks and alcoholic beverages has a wonderful ambience that both children and adults can enjoy. 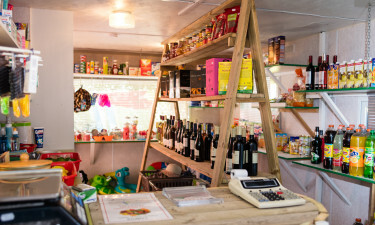 Campers can purchase bread on-site and there is a small supermarket within the grounds for all of those little necessities. Beyond the campsite but still within easy travelling distance, there are plenty of opportunities to visit bigger supermarkets and shopping centres.